An interesting modernist building designed in 1937 by Wacław Tomaszewski, who later became professor at Gdynia University of Technology. Linear arrangement of windows and external stairs are emphasized here. 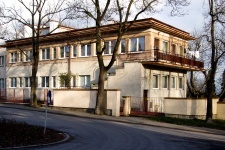 One of few office buildings in Kamienna Góra.